If you read Wakefield’s new business magazine, Topic UK, then you will see our MD Simon Cook getting to grips with their ‘Face to Face’ questions. Face to Face is a regular Q&A feature in the magazine where they ask business leaders from around the region a series of questions about their business and their personal life. 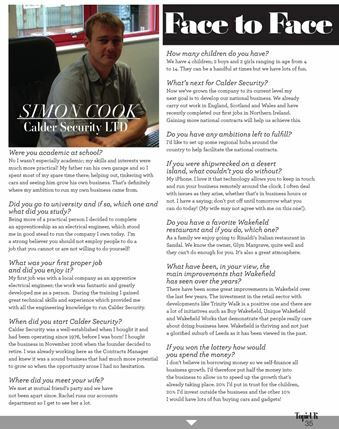 So if you’ve ever wondered what motivated Simon to buy Calder Security, what’s next for the business or even what Simon couldn’t live without on a desert island then you can read the full article here (page 35)! next Well appointed to look after your security!